On a recent trip to Norfolk, I spent a day at the RSPB’s Titchwell reserve. The clouds fully parted that day for the first time in weeks, and I wasn’t the only one who’d had the same idea. The reserve was heaving with birders. I had hoped to do some bird photography but I do sometimes wonder if I’m dedicated enough. Most of the afternoon I stood on the causeway in the sun with my camera trained on a flock of golden plover on the freshwater pools, waiting for them to take off. I was hoping to catch them at the very moment they took flight, but on the one occasion they did fly, my attention was inev itably elsewhere. But the sound of perhaps one thousand golden plovers calling mellifluously together was so enchanting, it didn’t really seem to matter whether I came away with photographs of them or not. Earlier in the day, after a very fine egg and bacon breakfast at the reserve cafe, I found my way to the Fen Hide. In my imagination a bittern would creep out of the reeds and I would come away with some stunning close-ups of a very rarely seen bird. In reality the only pictures I took were of water droplets on the hide window. I got a few strange looks from other birders there! Not that I’m complaining, because I think a couple of them are very good, but the session did lead to a lesson being learned. I was prepared for bird photography and had only my tripod, Canon 7D and 100-400 zoom lens with me; not really ideal for close-up photography. The 7D has only moderate ISO performance (in other words – it’s quite noisy), and the lens is an unwieldy beast. Camera shake, despite bright light, and limited depth of field were both potential problems. To counter the latter I tried to position the camera’s sensor plane parallel to the sloping window – which was tricky. I was imposing a set of limitations upon myself by not using the right equipment for the job. And the stupid thing was, the rest of my kit was in the van, no more than five minutes walk away! Despite that I did come away with some decent results as you can see from the picture. 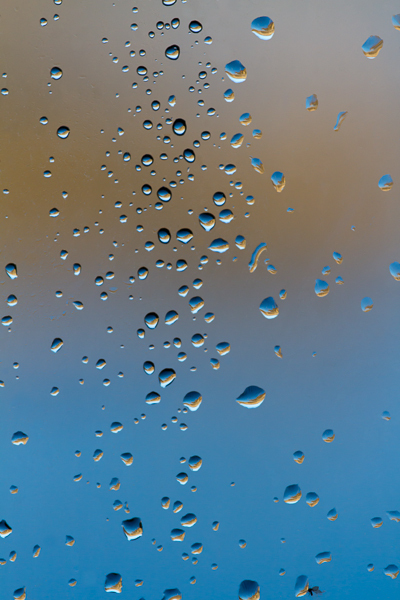 Each water droplet contains an upside-down, left/right ultra-wide image of the world outside – blue sky, golden reeds and water reflecting the sky. The black outline around many of them I think must be the hide. It has occurred to me how difficult it would be to categorise these photographs. Even though each one contains a number of “landscapes” and is taken more or less out in the landscape, could I – for example – enter one in a landscape photography competition? I’d be interested to hear your thoughts.